What's in a letter? The lower case letter at the end of this CI-friendly 50in plasma screen may look insignificant, but it packs one hell of a punch. It signifies that this Fujitsu TV has been tweaked for greatness - a quality that the P50XHA58EBb has in spades. This revamp of one of Fujitsu's existing plasmas begins with the screen itself: the glass has been updated to the tenth-gen Panasonic panel. Improvements have also been made to its AVM processing suite - colour management has been updated, as you're now provided with onscreen menu options that allow you to fine tune black levels, detail gradation and colour focus. Contour correction routines help to reduce the jagged appearance of some curved edges, and there's also a neat 24p/30p film mode facility. This latter flourish allows the screen to handle 1080p material, and also boosts the smoothness with which 24p/30p sources - step forward Blu-ray and HD DVD discs - are presented. As the P50XHA58EBb is a custom install offering (prices start at £2,895), there are a few notable omissions that you would expect to find on a high street flatscreen purchase. For starters, you don't get any speakers, tuner inputs or Scart connections, but there is an RS-232 control port on hand to integrate the screen into a home cinema system. Other connections include twin HDMIs, two component video inputs (together earning the P50XHA58EBb HD-ready status, along with the screen's native resolution of 1366 x 768), and a PC D-Sub jack. In full flight, it's soon clear that the tweaks have been money well spent: the P50XHA58EBb serves up tasty pictures in both standard and high definition. The original model had some problems with executing standard definition pictures, but these glitches seem to have been ironed out. 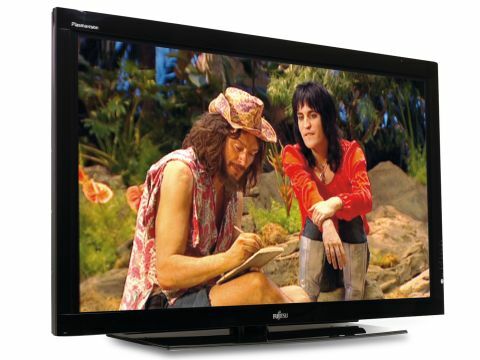 Standard definition material is now deftly handled, as the advances made to the AVM II video processing system and the plasma screen's glass embellishments have combined forces to create sharper and cleaner pictures. Advantage Fujitsu. Standard-def pictures are impressive (apart from some slightly orangey colours), but the main event - hi-def - is an absolute riot. The P50XHA58EBb's major achievement is how clean and sharp images look. Watching Superman Returns on HD DVD, every detail - from backdrops to the actors themselves - is visible in incredible clarity and there's no trace of irritating grain or dot crawl to detract from this high definition feast. Motion is also superbly handled - great news for such an action packed movie as Superman Returns. Motion blurring and loss of picture resolution are things of the past here, and there's no trace of noise: it's a performance that puts many a large plasma screen to shame. More good news comes with the P50XHA58EBb's greyscaling performance - dark scenes look as realistic as bright ones - and excellent black levels that are executed without greying over. Our only real niggle is that the screen reflects ambient light, which makes watching this TV in a darkened room a must if you're to take advantage of those deep black levels. The P50XHA58EBb is not without minor criticism, but it stands tall as an installer's dream and a wicked HD performer too.